Find the current class schedule here. Pump your body to build strength and endurance in each muscle group. Workouts rotate through upper and lower body routines. You’ll leave class feeling trim and toned. A popular, high-energy, fun and challenging class! Whether it be a circuit format, or a hgih intensity interval class, you will be challenged to keep up with your classmates and push through to the finish. Each class is different every time, but always motivating! Class will consist of 30 minutes of various cardio, including step, kickboxing, and floor routines. We will complete class with 10 – 15 minutes of ab and core exercises to strengthen your midsection and help create a strong foundation for your body. A great class to begin your day on the right path towards optimal health. We vary classes between step, floor routines, cardio kickboxing, and more to condition your heart and lungs while having fun! Join us for this heart-pumping class that will leave you ready to take on your day! This non-impact, individually paced, cardio class involves various cycling drills that offer an exhilarating cardiovascular workout. Be prepared to sweat! 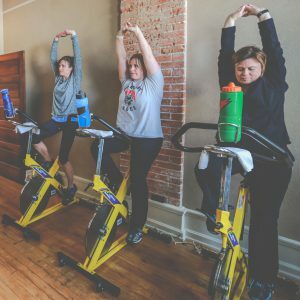 Come in over lunch and experience the perfect combination of cross-training cardio on the cycles and then work on your core strength with a new challenge every month. Using a variety of training techniques and exercises, this class focuses on total body conditioning through short duration high-intensity intervals… burpees, pushups, situps, jump squats, etc. You will feel the burn in this class! This intermediate/advanced outdoor class utilizes challenging segments of cardiovascular work, muscle conditioning, and athletic drills in a station format to ensure a complete total body workout. Enjoy the summer weather while pushing yourself through this fun, invigorating and calorie-blasting workout! Come experience the ideal blend of stretching, balance and core exercises. This class is designed with many purposes, including helping those new to exercise, those looking to add variety or balance out their existing workout routine, or those looking for a cool down after a challenging workout! A fun class for all abilities and ages! This class uses water resistance to get an effective workout while minimizing joint impact. It is a fun change of pace for those in need of a change in their workout, and it’s also a great way to begin a workout program. We only get a few months of this class, don’t miss out! No swimming ability required. This unique class will suit any and all fitness levels. UC is the prime full body workout we all want, plus additional core is added in our semi-intense Pilates segment that is mixed with deep Yoga style stretches to increase range of motion and lower your risk of injury. Give this class a try! The name of this class says it all!!! We will take our endurance to the max as we work our way through challenging movements that strengthen and tone our biceps, triceps, shoulders, back, and core along with our glutes at the same time. A fun multi-joint strength workout! Looking for a change in your workout routine? Cardio kickboxing is the answer! We utilize upper and lower body movements to kick and punch our way through class. A fun way to burn calories and de-stress at the same time! Monday is the perfect day to rise and shine to a new challenge! A fun mix of circuits, intervals, step and kickboxing, along with utilizing a variety of resistance training methods including supersets and pyramids to build strength and endurance. Offering a wide variety of training styles, equipment, and class design. Cardio, strength, and core exercises will be included in the mix but something different each class. Enhance your overall fitness, gain strength, and stay motivated! Spend 30 minutes of your noon hour cycling your way to improved health, and still have some time left for lunch! This class will challenge you along the way to make the most of these 30 minutes. You will leave class ready to take on the afternoon! This non-impact, individually paced, cardio class involves various cycling drills that offer an exhilarating cardiovascular workout. The fun music will motivate you to work hard in sprints, hill climbs, and endurance workouts. Be prepared to sweat! An energizing cardio conditioning class utilizing martial arts based kicks and punches. A fun way to test your coordination, balance, and stamina! Building up your core stability and endurance will be a major plus! Save time and boost your metabolism for hours after you workout with this highly effective style of training. Back to back resistance exercises, performing each rep with high effort and good technique. Anyone can do this workout; it’ll be great to stay motivated together! Core strength, flexibility, stability, and balance are all incorporated into this fusion of Pilates and yoga. You will be lead through poses and exercises to tighten, tone, and stretch those muscles. This class is for all ages, fitness levels and abilities. A high-energy, interval class that alternates aerobic movements with strength and stabilization exercises. We focus on high and low intensities to rev up your metabolism and work your muscles to the extreme! Challenge your entire body in this strength building class. Various exercises utilizing dumbbells, resistance bands, and body weight, along with quick cardio bursts, will build lean muscle that will burn more calories throughout your day. Come feel the burn. This class encourages a healthy body and mind while focusing on strength, balance, and flexibility. Suitable for all fitness levels – can be modified for your particular situation. Are you ready for some fun? Join Jodey on the dance floor for a party atmosphere you won’t want to miss! This Latin-inspired dance fitness program will keep you a movin’ and a shakin’ your way to a healthier you! No previous dance experience required. This class incorporates the fun international dance rhythms used in the original Zumba program, and modifies it slightly to accommodate people who are beginning their exercise regimen, people who are recovering from an injury, or the active older adult. Come join us for great music with basic, simple steps that focus on a good cardiovascular workout that also helps maintain balance and flexibility.